Have you been to a restaurant and seen people awkwardly taking photos of their food? What about in the grocery store? Those oddballs taking pics of the front of a restaurant or each page of a menu either have a food blog, or they Yelp. Surely, you've heard of Yelp, no? If not, I'm positive you've seen a circular red sticker on a store, restaurant, or other establishment's front door that says "People love us on Yelp!" Right? Still not with me? Ok, the map on the right side of my blog is my Yelp review tracker. Pretend like you know. Yelp is where you go to rant and or rave about your experiences at restaurants, bars, stores, movie theaters, nail salons, etc. You name it and Yelp's got it. Photos and many, many reviews of these places for your perusing pleasure. It's especially helpful when you want to go out to eat and don't know where to go! Once a week Yelp sends out a newsletter and I was so giddy the day that one of my reviews was featured! 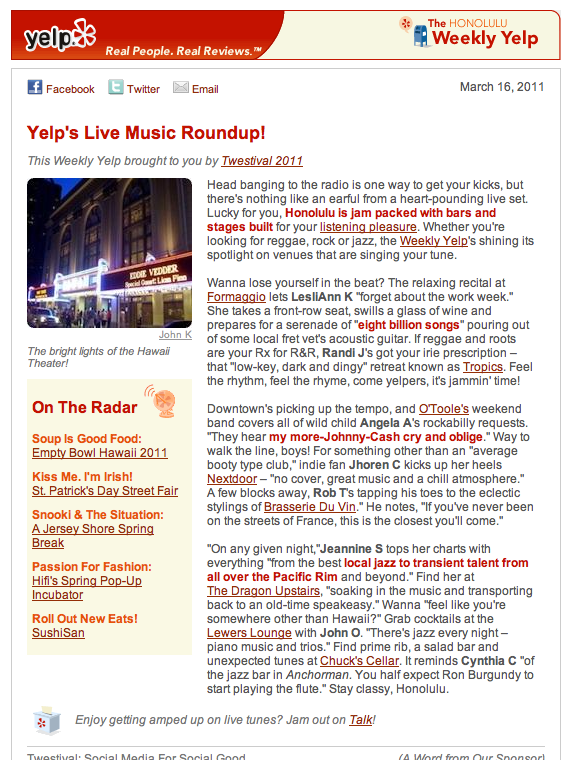 There I was, Angela A, in the "Live Music Roundup." What's even better is that I was talking about the band at O'Toole's, my FAVORITE Irish Pub and the classy establishment where Bryce and I met! The review is correct, I want more Johnny Cash at all times! And what do you know, just one week later I was in the review, again! 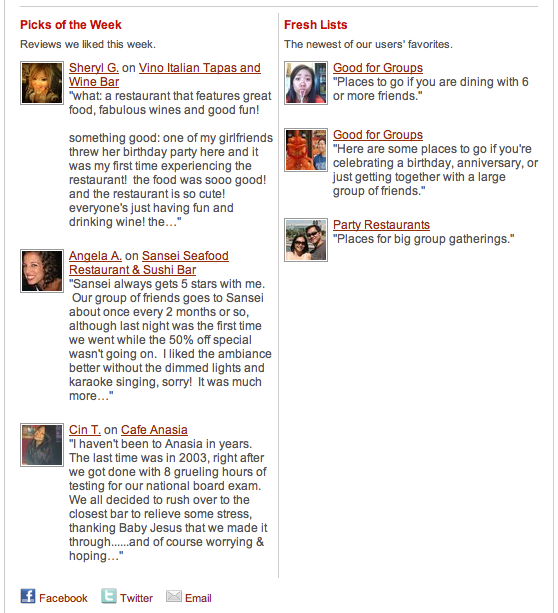 This time yapping, I mean Yelping, about Sansei, a sushi restaurant in Waikiki in the Yelp "Group Thang" collection. This time, they even used my little mini photo, too. Being in a local newsletter, in the grand scheme of things, is no big deal. Doing it two weeks in a row is twice as unimportant, really. Not a big deal but made me feel TOTALLY COOL! I haven't scheduled the dates for my book signing tour just yet, but I'll post it on my fan club website as soon as my assistant and manager get the details all worked out! If you Yelp, too, let's be friends!